PHOENIX (KSAZ) - Did you happen to see what happened in the night skies over Phoenix, 21 years ago Tuesday night? Some say it was only flares dropped by air force fighters. Some say it was hot air balloons. Others, however, say what they saw over the Valley that night was much more, and more are coming forward about it all the time. The sightings over Phoenix that night would become known as the Phoenix Lights. "We have come such a long way in 21 years," said Lynne Kitei. "Some people saw these things take off at great speed without even dispersing the air." 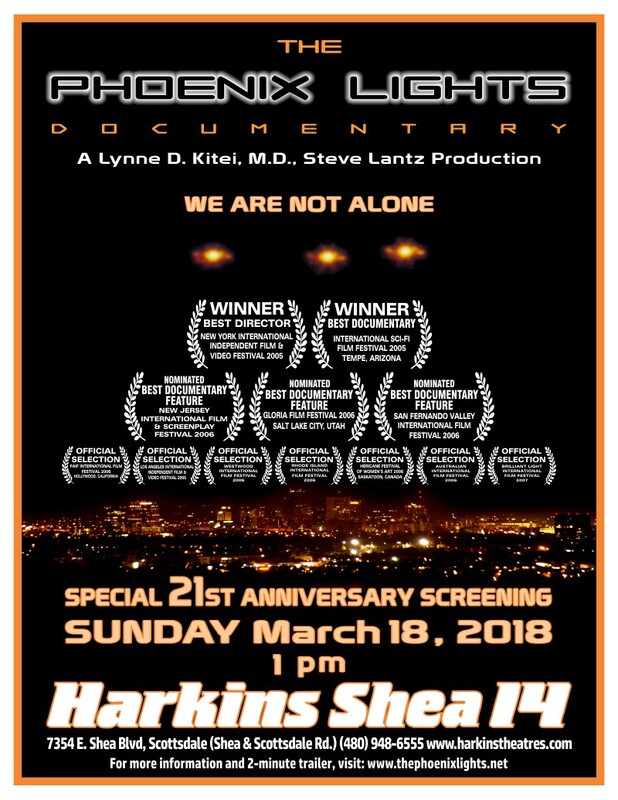 Years later, the sightings would become part of a book, The Phoenix Lights, a graphic novel, and documentary film, all by Kitei, Phoenix physician who witnessed the Phoenix Lights, but didn't come forward until seven years later. "So many people are afraid to come forward because they are so ostracized," said Kitei. But what were the Phoenix Lights? Most would say it's one of the most widely reported UFO sightings of all time. "On March 13 1997, while thousands of people were looking at the sky to see the Hale-Bopp Comet, they also caught a glimpse to a mile even larger, these orbs of light in a 'V' formation, equidistantly spaced," said Kitei. What's changed 21 years later? Plenty, according to Kitei. "New York Times had a big article announcing the UFO disclosure by the Department of Defense," said Kitei. "The Pentagon actually has been studying these phenomenon." The report lit a fire among those who believe the truth is out there, and more witnesses keep coming forward, like Dr. Brad Evans. The behaviorist and neuropsychologist says he and his wife saw the Phoenix Lights, while driving north on I-10. "These were very distinct, round, crystal clear lights," said Evans, who is also a pilot, and once told his wife he had seen it all. "Pretty suddenly she pointed ahead," said Evans. "She said, 'well, what's that then?' I said I had no idea." The craft Evans says he saw was fast, and big. "In an instant, they were directly overhead as if there was no time in between," said Evans. "You could clearly see one light, two football fields best guess, to the west, easily two football fields for the other light east of I-10." Why did Evans wait 21 years to speak out? As a psychiatrist, he had seen what happened to professionals who spoke out before. "Other folks, I think, like us, repressed it," said Evans. "There was nothing to share. We didn't talk to anybody for months." Now, however, Evans says people should speak out without fear. "Write about it. Talk about it. Share the experience. Don't worry. It's 21 years ago," said Evans. "The giggling and ridicule and snickering has gone on for much too long," said Kitei. "It's really starting to dissipate." Something else that's new is a Phoenix Lights exhibit at the Arizona Historical Museum in Tempe, where people can see a timeline of the sightings, as well as alternative theories to what happened that night. While no one is sure what was really over the skies of Arizona 21 years ago, Kitei says the most important thing is to keep asking questions. "We may not have the technology yet to define what these things are. That doesn't mean they aren't real," said Kitei.